Nagaur District GK in Hindi नागौर जिला Rajasthan GK in Hindi Here we are providing Rajasthan gk in hindi for upcoming exams in rajasthan. rajasthan gk questions with answers in hindi, rajasthan gk hindi, rajasthan gk notes in hindi. Rajasthan Gk in Hindi MCQ DOwnload. v मेड़ता सिटी – देश की पहली रेल बस [मेड़ता शहर से मेड़ता रोड (15 किमी) सन् 1994 में प्रारम्भ प्रतिदिन यह रेल बस छ: चक्कर लगाती है. v राजस्थान में अनुसूचित जनजाति की सबसे कम आबादी. v राज्य के सर्वाधिक पशु मेले नागौर में आयोजित किए जाते है. v राज्य में सर्वाधिक दलहन का उत्पादक जिला. v सर्वाधिक क्षेत्रफल में मुंग बोई और उत्पादन सर्वाधिक होता है. v पशु सम्पदा नागौर जिला का चौथा स्थान है. v क्षेत्रफल à 17,718 वर्ग किमी. v बांध à भाकरी भोलास, हरसोट, मुंडवा का लाखोलाव तालाब, डेगाना का प्रताप सागर, परबतसर का पीर जी का नाका और डेगाना का हरसौर बांध प्रसिद्ध है. v इतिहास à राजस्थान के निर्माण से पूर्व नागौर जोधपुर रियासत का भाग था. v प्राचीन नाम à अहिच्छत्रपुर था. v स्थानीय प्रशासन à उपखंड – 9, तहसील -10 , उप तहसीले -7 , कुल राजस्व ग्राम -1577 , ग्राम पंचायत -461 , पुलिस थाने -30 , चौकियां -21 , कारागृह -5 , निकाय -10 , विधानसभा क्षेत्र -10 , पंचायत समिति -11, नवीनतम घोषित ग्राम – 77, पटवार सर्किल -432.
v नागौर जिला राजस्थान का सबसे बड़ा जिला है. जिला कलेक्टर जिला प्रशासन का सिर है. जिला प्रशासन में दो अतिरिक्त जिला मजिस्ट्रेट (नागौर एंड डीडवाना) उसे प्रशासनिक कर्तव्यों केनिर्वहन में मदद. तहसील “पटवार – मंडलों की एक संख्या है, जिनमें से प्रत्येक एक ‘पटवारी landholders औरकिसानों के लिए गांव स्तर पर सेवा में शामिल है. कुचामन, देह, मौलासर, संजू, रियान, भेरुंडा और पीलवा – सात अपर / उप तहसील अर्थात् हैं. v विभिन्न विकास और ग्रामीण स्तर (ग्राम पंचायत स्तर) पर काम करता है परियोजनाओं ब्लॉककार्यालयों के माध्यम से चलाए जा रहे हैं. एक ग्राम सेवक प्रत्येक ग्राम पंचायत में नियुक्त किया जाता है विकास कार्यों का रिकार्ड रखने के लिए और आवश्यक विकास कार्य परियोजना. “ग्राम सभा(विलेज बैठक) निश्चित अंतराल पर आयोजित कर रहे हैं गांवों के विकास के बारे में चर्चा. जिले में 461 ग्राम पंचायतों हैं. डीडवाना को लोग आभा-नगरी उपकाशी के नाम से भी जानते है ! v कुचामन – लोकनाट्य कुचामन ख्याल के लिए प्रसिद्ध है. लच्छीराम इसके प्रसिद्ध कलाकार है. v डीडवाना – यहाँ पर खारे पानी की झील स्थित है जिसका विस्तार १० वर्ग किलोमीटर है क्षेत्र है. यहाँ प्रमुख उद्योग राजस्थान स्टेट केमिकल्स वर्क्स स्थित है जो सोडियम सल्फाइड व सोडियम सल्फेट का निर्माण करता है. v गोटन – सन् 1984 में सफेद सीमेंट का बनाने का राज्य का पहला कारखाना स्थित है. v मेड़ता सिटी – भक्त शिरोमणी मीरा बाई का विशाल मंदिर . [ चारभुजा नाथ मंदिर इसका का निर्माण मीरा बाई के पितामह ने करवाया था ] श्रावणी एकादशी से पूर्णिमा तक प्रतिवर्ष झूलोत्सव मेला लगता है. मेड़ता के राजा मालदेव ने भी मालकोट किला बनाया. v जायल – गोठ मांगलोद गाँव में दधिमाता का प्राचीन मंदिर है. v नागौर दुर्ग – अमरसिंह राठौर की नगरी नागौर परकोटे के मध्य बसाई गई थी. नागौर दुर्ग धान्वन दुर्ग का उदाहरण है. राव अमरसिंह राठौर की छतरी – नागौर में झडा तालाब में. v भवाल माता का मंदिर – मेड़ता सिटी से 32 किलोमीटर की पर जसनगर क पास भवाल माता का मंदिर. v जिप्सम – देश में कुल उत्पादित जिप्सम का 93 प्रतिशत राजस्थान में होता है राजस्थान के जिप्सम के दो-तिहाई भण्डार नागौर जिले में है. S.No. Category of Road Length in Kms. नागौर किले – सैंडी किला, केन्द्र स्थित है, 2 सदी पुराने, देखा कई लड़ाइयों, उदात्त दीवारों और विशाल परिसर, कई महलों और मंदिरों के अंदर रही है. Tarkeen दरगाह – अजमेर दरगाह के बाद हाल प्रसिद्ध पवित्र जगह है, मुसलमानों और सूफियों के लिए. ग्लास में जैन मंदिर – कांच की बुलंद संरचना, जैन समुदाय के लिए पवित्र जगह. Saiji का टंका – एक प्रसिद्ध संत की समाधि, सादगी और सच्चाई के साथ आत्मा की मुक्ति प्रेरित करती है, सांप्रदायिक सौहार्द के एक प्रतीक है. खींवसर — खींवसर फोर्ट राष्ट्रीय राजमार्ग जोधपुर की ओर नंबर 65 पर नागौर से 42 किमी दूर स्थित है, थार रेगिस्तान के बीच में 500 साल पुराना किला, आधुनिक सुविधाओं से सुसज्जित होटल में बदल गयाहै. मुगल सम्राट औरंगजेब यहाँ रहने खींवसर शहर के 25 छोटे मंदिरों, काला हिरण झुंड में घूम केएक बहुत लोकप्रिय पर्यटक आकर्षण हैं. Nagaur districtis located in the heart of the Rajasthan state between 260.25” & 270.40” North Latitude & 730.10” & 750.15” East Longitude. 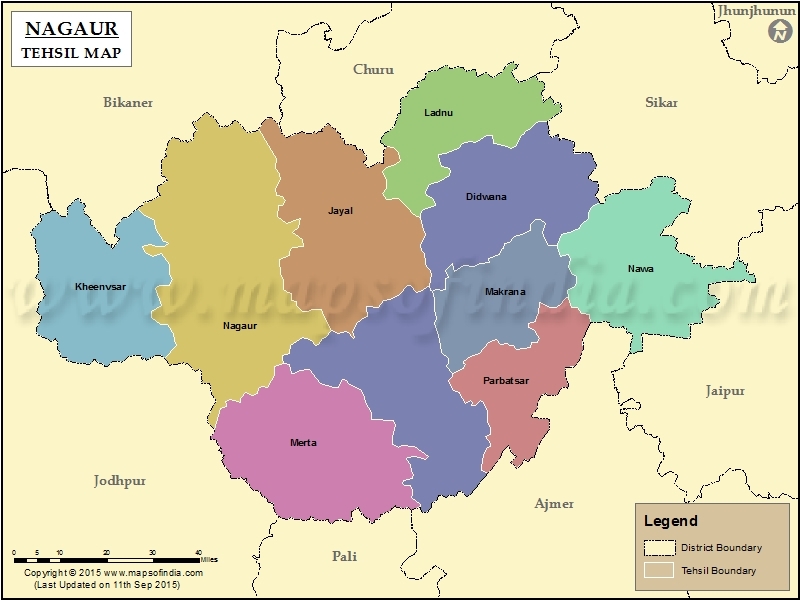 The district boundary is shared by seven districts of Rajasthan viz.-Jaipur, Ajmer, Pali, Jodhpur, Bikaner, Churu and Sikar. Nagaur is the fifth largest district in Rajasthan with an area of 17,718 Square Kms. It has been divided into 12 tehsils namely . Nagaur, Merta, Jayal, Ladnun, Didwana, Nawa, Makrana, Degana, Parbatsar, Khimsar, Kuchaman City and Mundwa. Glorified by the bards, the history of Nagaur finds mention even in the Mahabharata. The kingdom of Ahichhatrapur which Arjuna is said to have conquered and offered to his Guru Dronacharya, was perhaps some of the area of the Nagaur district. It was the capital of Jangladesh. The foundation of city dates back to 4th century BC. Nagas originally ruled over this place and about 7th century onwards the Chauhans became the overlords of Nagaur and it was included in Sapadalaksha. After independence, Nagaur had the honour of being selected as the place in the country from where the Democratic Decentralisation (Panchayati Raj) process was launched by the late Shri Jawaharlal Nehru, the first Prime Minister of India on the 2nd October 1959. It is said that Nagaur fort was initially built by ruler of Nag dynasty in 2nd century and was then rebuilt in the early 12th century. This fort has witnessed several battles and has also been altered multiple times. Being one of the first Mughal strongholds in North-India it is an outstanding example of Rajput-Mughal architecture. 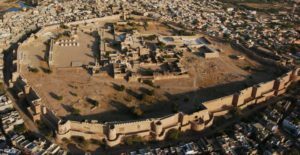 It is said that the Nagaur fort was initially built by the ruler of the Nag dynasty in 2nd century, and this 500 year old fort, located on the eastern edge of the Thar Desert was built in about 1523. Mughal Emperor Aurangzeb used to stay at this fort. Black deer roam in herds around this fort. Nagaur district is well known in the world over owing to the presence of Makrana marble. Marble occurring in the vicinity of Makrana town is so famous that ‘Makrana’ has become the synonymous of marble. Word famous Taj Mahal of Agra: Victoria Memorial, Kolkata: Delwara Jain Temple at Mount Abu and Ranakpur Temple in Pali & other famous monuments of excellent architectural art and beauty are constructed of Makrana marble. Kuchaman Fort is the oldest & most inaccessible forts of Rajasthan. Situated on top of a straight hill, it possess unique water harvesting system, a beautiful palace and stunning wall paintings. The rulers of Jodhpur used to mint their gold and silver currency here. Khatu’s old name was Shatkup (six wells). When Shak rulers came to India then they brought two new wells with them which were called Shakandhu (Stepwell) & Kalandh (Rahat). Accoring to Prathivraj Raso, Khatu’s old name was Khatwan. Old Khatu is almost destroyed. Now there are two villages, one is called Bari Khatu & other Chhoti Khatu. On the hillock of Chhoti Khatu a small fort built by Prathviraj Chouhan still stands. An old stepwell is located in Chhoti Khatu, known as Phool Bawadi, is believed to be constructed in Gurjara Pratihara period. The town of Ladnu in the district has gained its place on the map of the country being the headquarters of the famous ‘Jain Vishwa Bharti’ which has become a centre of spiritual learning & knowledge under the leadership of Acharya Tulsi, a great Jain saint, who has propagated the philosophy of “ANUVRAT” in order to enlighten people in this area of the country. Also known as Goth-Manglod temple, 40 km away from Nagaur; the oldest temple of the district constructed during the Gupta Dynasty (4th Century), Kul Devi of Dadhich Brahimins. This village was established in the name of Lok Devta Gogaji and it is believed that Gogaji’s Barat-marriage party had stayed here. This is the third largest cattle fair in Rajasthan founded by the great King of the Jodhpur Dynasty, Umed Singh in honour of Shri Ramdeoji 56 years back. The fair continues to be held in the month of Magh (January / February). Although the famous Nagauri bull is the prime attraction of the fair, the indigenous breeds of camel, horses, bullocks, buffalos, goat and sheep are in no way less attractive buys. Traders from all over the country participate actively and vie with each other in purchasing high pedigree animals to upgrade their cattle. It is held in the month of Chaitra (March / April) at Merta city every year. Its history dates back 36 years when this fair was initiated in the memory of the great leader of the farmers Baldeo Ram Mirdha. 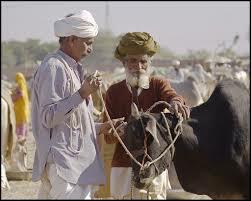 The Nagauri breed of cattle are traded here in abundance and cattle competitions are the biggest attraction of the fair, providing a glimpse of rural Rajasthan. This is the second largest fair held every year in the month of Shrawan (August / September) at Parbatsar. It is primarily cattle fair but routine things are also bought and sold. Its history dates back to pre-Independence. 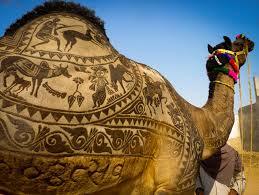 Apart from the above mentioned fairs, a number of other fairs are also held in Nagaur district. These include the Sheetla Asthami mela, Hariram baba ka mela, Hanumanji ka mela, Meerabai Charbhuja mela, Parsawanathji ka mela, Sufi Tarkeen Salana Urs, Mataji ka mela, Gusaiji ka mela, Jhulotsawa and the Narsingh Chaturdarshi mela among others. A big part of the district is covered by blown sand and sand dunes which form part of the great Thar district. Active dunes and sand shifting are main hazards to cultivation. Sand dunes are common in the north and western parts, where they arise over 30 meters and are aligned in a north west and south cast direction. Constant deterioration of soil and mining activity has resulted in soil erosion. The Aravali range of hills passes in eastern and south eastern part of the district. The average elevation of the hills in district is barely 310 meters. A big salt lake exists about 3 Km., to the South West of Deedwana. A part of the famous Sambhar lake falls in Nagaur district. There is no perennial river in the district, River Luni is a non-perennial river which flows through the district. The flow of river-Luni depends upon the volume of rain fall it receives during monsoons. The river rises near Pushkar in Ajmer district and after passing over the Western slopes of the Aravali enters Nagaur district in the south and flows through it towards the west for nearly 37 Kilometers before entering Pali district. The western part of the district is devoid of natural vegetation cover except for low hurbs and grass which grows on low sand dunes. However, the south-eastern part of the district and part of the northern tehsil of Ladnun & Deedwana have much greater greenery as compared to north-west part of the district Khejri trees are commonly found in the district. Limestone occurring in the district belongs to Bilara Group of Marwar Supergroup. It occurs in three prominent belts. The first major and important belt is passing through Gotan, Bilara, Heera, Keria, Hari Singh, Bhawanda, Tadas, Tankla, Manakpur, Bher, Madpura-Gujron Ki Dhani, Chawandia and Tantwas. The second one is passing through Mundwa, Rol-Quazia, Gangwana, Surjniyawas Somna and Deh. The third belt which is comparatively smaller is located between Jayal and Katothi. As a result of exploration activities of various agencies in Rajasthan, lignite deposits/ occurrences have been proved at 34 locations in Bikaner, Nagaur and Barmer districts. In Nagaur, Lignite deposits have been confirmed at 9 locations viz. Merta Road and Meera Nagar, Mokala, Indawar, Kasnau-Igear, Kuchera, Matasukh, Kaparion-Ki-Dhani, Nimbri Chandawatan and Lunsare. Since long Makrana in tehsil Parabatsar is known in the world for the production of quality marble. Makrana marble belt has been divided into 14 blocks. Out of these 14 blocks, marble produced from Chausara block is white in colour and of best quality. Thick gypseous beds belonging to Nagaur formation are found around Nagaur, Bhadwasi, Khairat, Malgan, Manglot, Pilanwasi and Untiwalia village. Occurrences of tungsten in India are very few, the best known deposit being those of Degana area in Nagaur district. Here tungsten ore occurs in quartz veins along shear zones in the granite and also as stock works in these hills. It also occurs as alluvial deposit around the foot hills. The sandstone of Jodhpur group of rocks is exploited from Khatu and Ladnun area. Near Harsolpv and Nagaur, sandstone is extensively quarried for masonary purpose. The clays occurring in the district belong to the category of china clay and highly plastic ball clays which are added to induce plasticity and high bonding quality. Clay occurs at occur at Khajwana, Kuladah, Indawar, Mundwa, Nimbri Chundawatan, Saradhana and Huldah. In Nagaur district kuchera – Khajwana Formation (Eocene age) is reported to contain fuller’s earth associated with ferrugineous grits, gritty felspathic sandstone, black shale and lignite. As per the 2011 census, the population of the district is 33,07,743, which is 4.82% of the total population of the State. Decadal Growth of population between 2011 and 2011 was 19.20%. 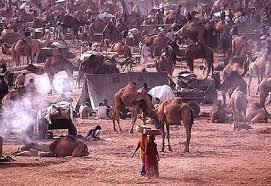 The density of population in the district is 187 persons persq.km, as against 200 of Rajasthan as a whole. Literacy rate is 62.80%. Out of this literate population 77.20% are males and 47.80% are females.